I should have had them both finished a week ago. 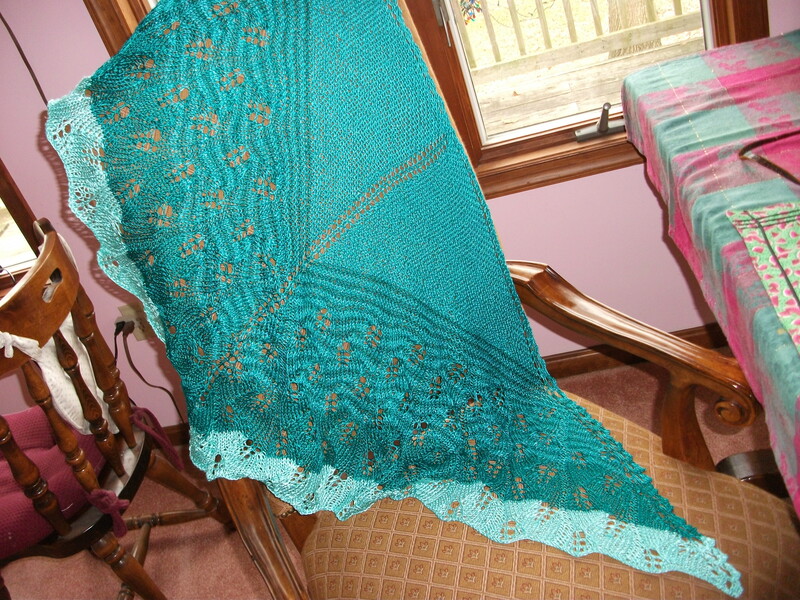 Instead I found two more skeins of the yarn–blue and light aqua. What do I do? Add it on, of course. I had finished the blue one so I had to undo the bind-off. I managed to do this without losing any stitches. Then, when I was knitting along, I forgot about stopping to check on how much was left. I found myself having to unknit two rows and wasting an hour. Bummer. See the light edge. I am not sure that I like it, but it’s staying. I have used up all of this yarn which was my main objective. I think that this was the best use for this yarn. It would not have made a very good garment. It does wash and iron nicely–always good for gifts. I forgot to take a picture of the blue one. Maybe tomorrow. I’m not promising.